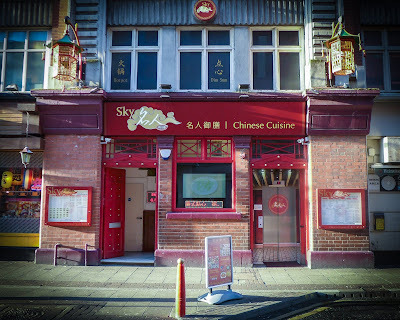 In the same way that the best theatre in New York is often to be found Off-Broadway, I’ve always found the best Chinese food in Newcastle is very much Off-Stowell Street. 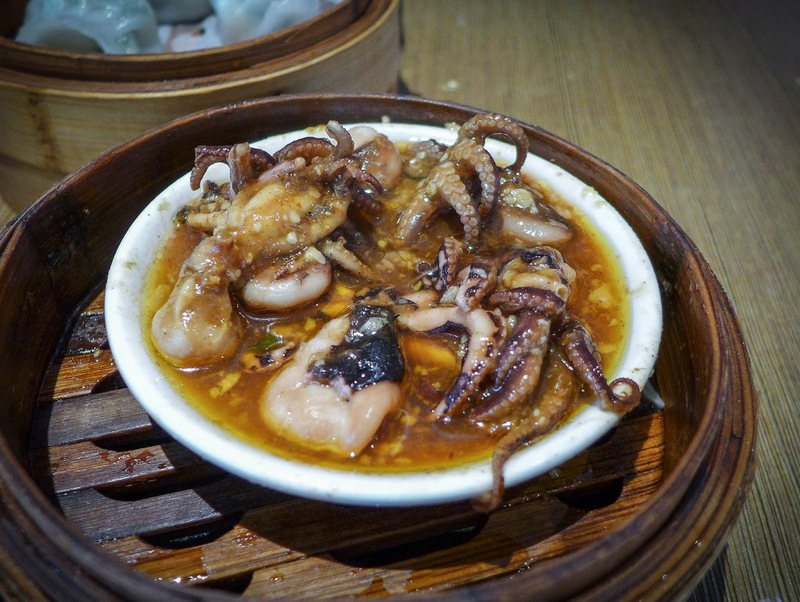 I’ve endured some ferociously bad meals at venues in our so-called Chinatown, from all-you-can-eat horror shows to overpriced renditions of your standard anglicized Cantonese gloop-fests. I have many pictures to prove it – but could never bring myself to publish them. Indeed, no Stowell Street venue has come close to the pages of this site. Until now. When I was last in China, just a couple of months ago, I seemed to spend most of my time eating. It is, after all, the main social preoccupation of the entire nation. 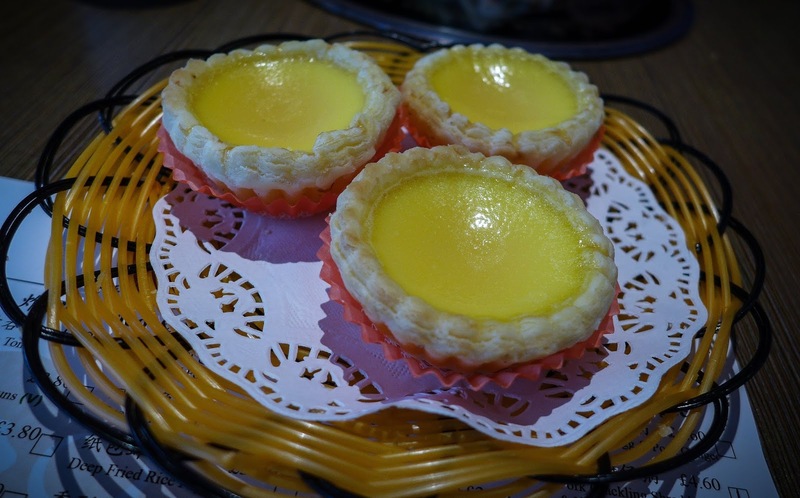 I was with a large group of Chinese business colleagues and, knowing my penchant for all things authentic and aversion to tourist haunts, they insisted on taking me to their most eccentric culinary dives. 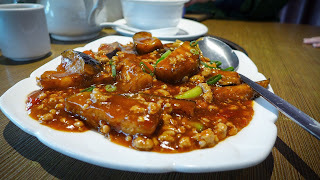 One highlight was an enormous family restaurant in Guangzhou (both the restaurant and the families were huge). Unclothed tables, glaring white light, a barn of a place, but I can’t think of a happier, more congenial location to while away four hours of my life. At the start of the meal, an enormous whale of a fish was dragged out of a pond outside and two men carried it through the restaurant to our table, dripping and thrashing in a massive net. The poor thing, once approved, was then dispatched to the kitchen, from whence it reappeared throughout the next two hours variously as raw, fried, poached, blended, pickled and chopped innards, skin and flesh, prepared in all manner of spicy things, a veritable nose (or, rather, eyeball) to tail experience. 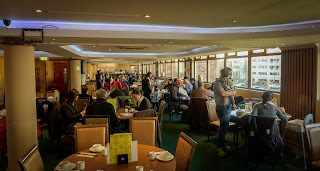 I thought of Stowell Street then, wondering how such fish theatre might go down with the crowds on a Saturday night, and indeed whether there was anywhere in Newcastle that came vaguely close to real Chinese mainland food (of which there are hundreds of different versions). Sadly not, however friends that know, or say they know, had always recommended Sky Chinese Cuisine, particularly for its dim sum. 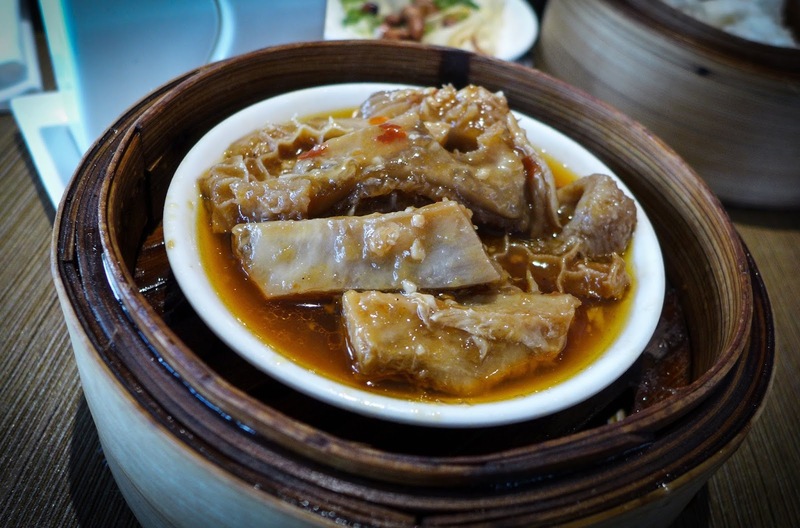 Dim sum is a fun way to eat, steaming baskets of dumplings and small plates of strongly flavoured morsels crowding the table. I mean, who doesn’t like dumplings? Nobody I know, and not anyone I would trust, that’s for sure. In the olden days dim sum trolleys circulated the room, with diners nabbing anything they like the look of as it careered past. I’ve eaten this way a few times and while fun, it can also be a random way to lose your hunger, not to mention the risk of selecting a basket of goods that last saw the heat of the kitchen some time ago. 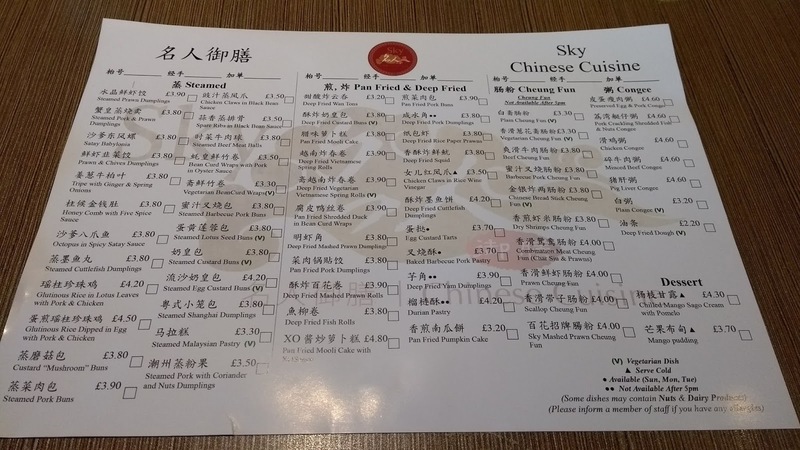 Sky Chinese Cuisine has deferred to the more modern and reliable way of ordering with a menu “scorecard”, marking how many of each dish you want and giving it to a server. Then you just drink the first of a great many cups of tea and wait for the fun to start. 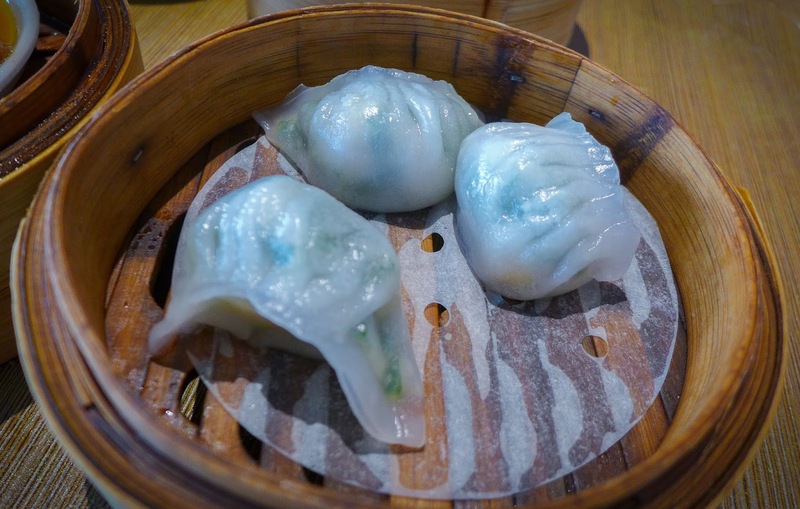 In fact Sky’s dumplings were about the least good things we tried. Their steamed prawn and chive efforts had a nice oniony kick but the dough was a bit thick and claggy. Char siu steamed buns are best when they perfectly straddle the line between floaty and stodgy, but these were mostly just stodgy, with not enough of that five-spice-fuelled filling. 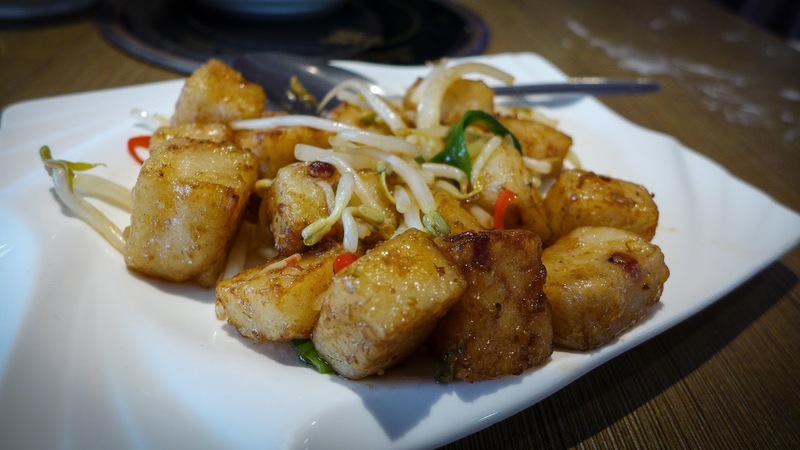 A plate of pan-fried mooli cake on the other hand was a revelation, cubes of the giant radish having been cooked to a lovely yielding consistency before being glazed in a lip smacking XO sauce and topped with chillies and beansprouts. I could have eaten any amount of this stuff. 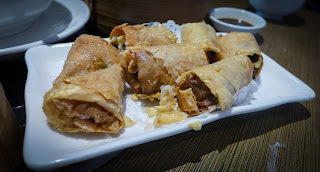 Shredded duck in bean curd wraps were also fun, shatteringly crisp curd giving way to moist ducky innards. 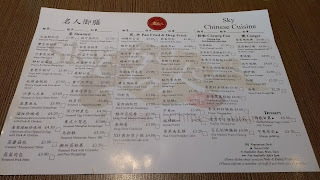 As well as the dim sum menu there’s an “English” menu (avoid), a Hong Kong menu (better) and a traditional Chinese menu (that’s the one), although this last is not translated into English. You can either negotiate with your waitress – ours was lovely, although I’ve heard reports of extreme curtness from elsewhere – or, for maximum comedy, put Google Translate in front of the laminated card. I don’t know what “Three of a kind”, “Honey jeans of bone”, nor “Radish cattle lung pot” are like to eat, but they gave us a laugh. Looking for something vegetable-based, we settled on a plate of Szechuan aubergine, which was excellent, the aubergine having been deep fried into a lovely creamy texture before being tossed with a rich and fragrant sauce of pork mince, soy and who knows what else. 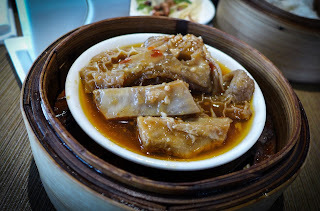 Back to the dim sum, and I think I’m developing a taste for tripe in my advancing years. Or not so much the taste, as there is none, but the texture, which can be the oddest combination of slippery, soft and crunchy all at once. The five spice sauce that Sky’s honeycomb tripe came in was a winner. Another slippery customer – an underrated food texture, at least for us here in Blighty – was the cheung fun. This is a sort of wide, flat noodle, usually made from rice and tapioca flours, which is steamed and served with a soy-based sauce. Ours was filled with shrimp and char siu pork. The octopus in spicy satay sauce were very tender and tasty, but almost embryonically small, leading to a slight twinge of guilt. Then I remembered the giant fish in Guangzhou, and reckoned they got off lightly. A bowl of congee proved to be the finishing of me. 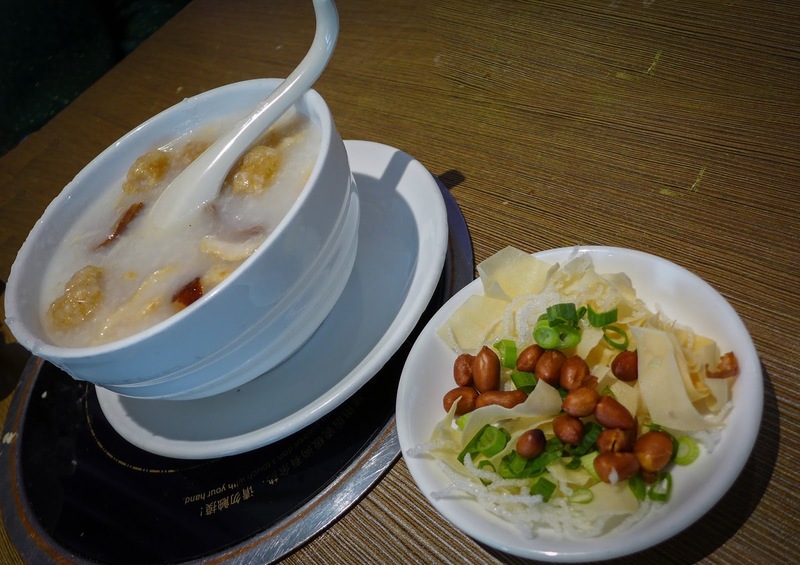 Basically a kind of porridge made with rice, congee is impressively bland and all the better for it. It would be a fabulous hangover cure, or perfect if you were laid low by some toxic lurgy. 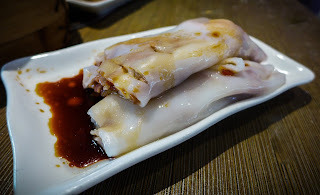 This one contained lumps of aerated pork crackling which had gone extremely soggy and shredded fish, with toasted nuts and scallions on the side to pep things up. We finished with some OK-ish egg custard tarts, but no one’s coming here for the desserts anyhow. What they are coming for – and the capacious room was fair packed with Chinese families – is a really fun, sociable and cheap way of eating a large amount of interesting food while drinking bathfuls of pleasant Chinese tea. 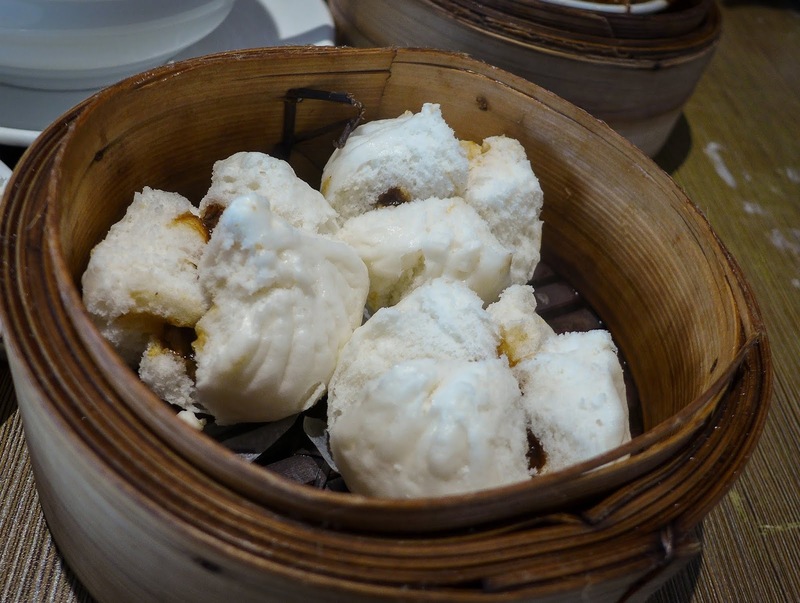 This is by no means the world’s greatest dim sum, although it may be Newcastle’s, and the room is a bit – what’s the word? – functional, but no matter: that makes it all the more authentic. The scorecard, the thrumming busyness, the bamboo baskets, the brisk, transactional service: I loved it. We paid just over fifty quid for way, way too much food even for two large appetites. We’ll be back before long, with a party of twelve, to do it all again.